Major spoilers ahead! During the promotion of his film, "Dracula Untold," Charles Dance revealed to MTV a tidbit about his "Game of Thrones" character, Tywin Lannister. It looks like he is not gone for good even though his son, Tyrion (Peter Dinklage), took him out whilst he sat on the...throne. It went a little something like this, "I'm not completely missing out on the next series...so, you haven't seen the last of Tywin Lannister..."
So what could it be? Clearly a flashback scene is possible even though there are not many in the HBO series. We did see Khal Drogo in that one heart-wrenching scene with Daenerys and their unborn child. Over the summer, WinterisComing.net revealed a bit of info regarding the casting of a young Cersei Lannister in the next season. This would make a Tywin appearance very plausible. 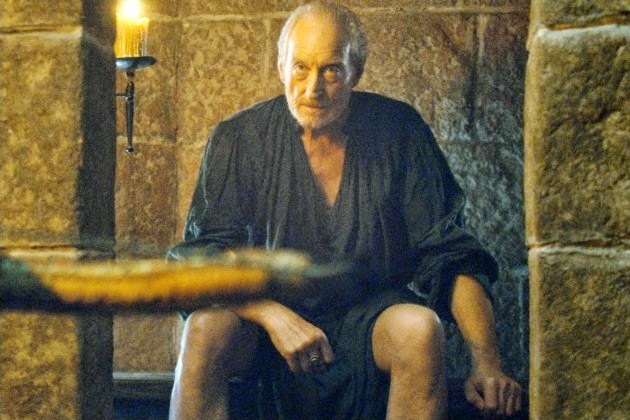 What are your thoughts and speculations on the return of Tywin? Maybe Tywin's ghost will haunt Tyrion when he is on the throne? Maybe not.